There are many fine museums in Normandy dealing with various aspects of the events surrounding D-Day, June 6th 1944. Normandy is only a two-and-a-half hour ferry crossing from England and the wartime sites of interest can be visited easily by car within the course of a weekend. To move around this page simply click the names on the map below. Above: Hanging from the church tower is a dummy paratrooper in honour of Private John Steel. Above left: Sherman tank in the grounds of the Airborne Museum. Above right: This excellent museum recounts US airborne operations in the region and includes an original Waco CG-4A glider and C-47 transport aircraft. Above left: Many smaller displays surround the main exhibits. Above right: It is possible to walk through the fuselage of the Waco glider. 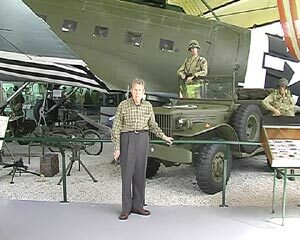 Above: 506th PIR veteran Col. Ed Shames pictured near the C-47 during August 2005. 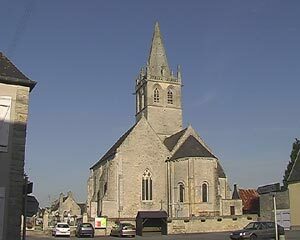 Above left: The Church at Ste. Come-du-Mont. 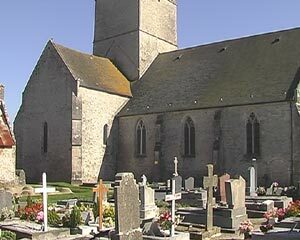 Above centre: During the early hours of June 6th 1944 T/4 Jo Beyrle landed on the roof of this church and slid down into the graveyard. 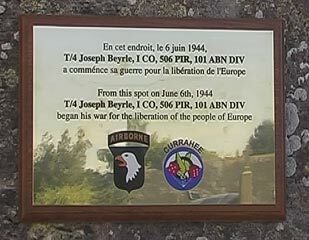 This plaque marks the spot where he started his war. Above right: The plaque is on the northern side of the church, second buttress from the right. Chateau le Bel Enault. A German command post on D-Day captured by the 501st PIR. Above left: Two of the four gun emplacements at the battery. Each emplacement was equipped with a French made 105mm gun. Above right: On the left of the picture can be seen the remains of imitation stones painted onto the casement. This battery was captured by US Rangers on D-Day. Before their assault the position was heavily bombed and many bomb craters still remain. A Rangers museum is located in the nearby village of Grandcamp. 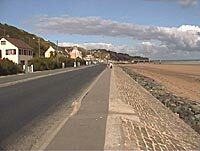 Above left: Omaha Beach. Above centre: This museum at St. Laurent contains some very fine exhibits and displays. Above right: 82nd and 101st display which includes some very rare items of equipment. 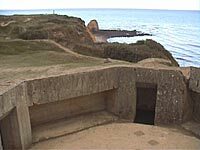 Above: The only gun battery on the Normandy coast to have retained its original guns. Because all harbours along the Normandy coast were heavily defended, the allies decided that any attempt to capture a sizeable port such as Cherbourg would be prohibitive in terms of lives lost. Therefore they brought across from England two prefabricated harbours which were built at St-Laurent in the American sector and Arromanches in the British sector. Remains of the artificial harbour at Arromanches can still be seen today. 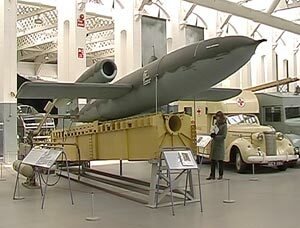 Above: An original V1 'Doodlebug' on part of its launch ramp pictured at the Imperial War Museum, Duxford. From the summer of 1944 Nazi Germany unleashed a frightening new series of vengeance raids on England. Bombs for the first time in the history of warfare were being flown to their targets by remote control from camouflaged launch sites many miles away in France. 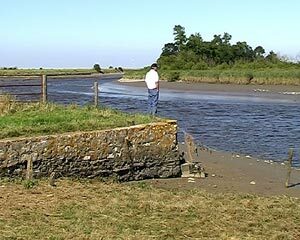 The above photographs were taken at La Sorellerie and L'Orion, about five miles south of Cherbourg, and show two V1 launch sites that were aimed at Bristol. They are not particularly easy to locate, being in the middle of fields and difficult to identify from the road. But if you are determined to find them you are in for a treat as they are both in reasonable condition. However, the allies bombed both sites and resulting damage to some of the buildings is evident. 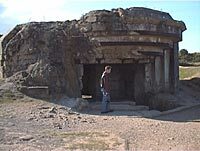 The sites in Normandy were never actually used by the Germans as they were still not fully complete at the time of the allies assault on D-Day. In fact by 6th June 1944 the Nazis had already retreated to V1 sites built earlier in the Pas-de-Calais region. Left: La Sorellerie. Most of the buildings on this site are in open farmland and during construction must have been clearly visible to allied reconnaissance. La Sorellerie was heavily bombed but despite this most of the buildings are in good condition. This picture shows from right to left the wall of a V1 reception building, the compass alignment building, and the actual launch ramp. Left centre: One of the three V1 'Ski' storage buildings at La Sorellerie. The term 'ski' was used by wartime photo interpreters to describe these buildings, because from above they resemble the profile of a ski. The hook of the ski was always at the entrance end of the structure. This building has suffered quite badly from allied bombing raids. Right centre: The inside of a 'Ski' storage building this time at the L'Orion site (about one-and-a-half miles east of La Sorellerie). It was taken from about a quarter of the way down the building looking back towards the entrance. 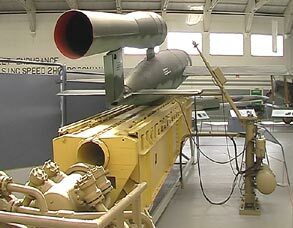 The V1s would have been kept here minus their wings and warhead before being transported to a workshop prior to launch. This building is in excellent condition with original wooden shutters still in the ceiling. This building is covered with a protective layer of soil and grass and as a result is almost invisible from the outside. Right: The compass alignment building at L'Orion. Here the V1s compass, located in the missile's nose, would have been adjusted precisely so that the bomb flew on an accurate course. 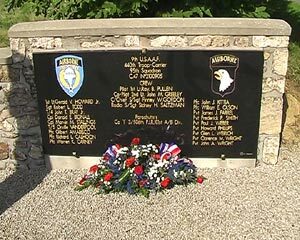 On the western edge of the small village of Magneville stands a memorial stone erected in memory of eighteen 506th PIR paratroopers and four 95th Troop Carrier Squadron flight crew. These 22 men lost their lives during the early hours of 6th June 1944 when the crippled aircraft (2100905) in which they were flying crashed. by Joe Beyrle II and Col. Ed Shames. 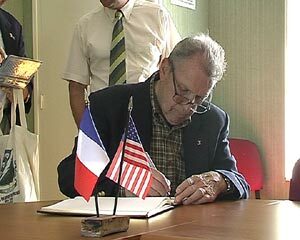 Above right: 506th PIR veteran Col. Ed Shames signing the town's visitors book, 10th August 2005. Flight crew details: 1st Lt. Ray Pullen; 2nd Lt. John Greeley; S/Sgt. Finney Gordon; S/Sgt. Sidney Saltzman. Paratrooper details (All from the 3rd Battalion, 506th PIR): 1st Lt. Gerald Howard; Sgt. Robert Todd; T/4 John Bray; Cpl. Donald Bignall; Cpl. Marvin Stallings; T/5 Orville Vanderpool; Pfc. Gilbert Amabisco; Pfc. Richard Calhoon; Pfc. Warren Carney; Pfc. John Kittia; Pfc. William Olson; Pvt. James Farrel; Pfc. Frederick Smith; Pvt. Paul Weber; Pvt. Howard Phillips; Pvt. Glen Weirich; Pvt. Clarence Wright; Pvt. John Wright. 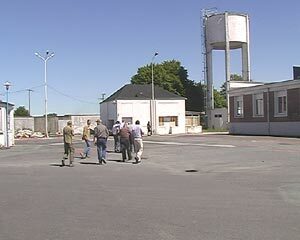 Above left and right: On the eastern edge of Carentan is an old factory that during the war was owned by the Carnation Milk Company. 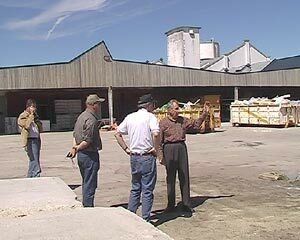 Ed Shames (HQ 506th PIR) landed in the grounds of this factory during the early hours of June 6th 1944. He made a nostalgic return on 8th August 2005. About one mile west of Carentan is a sunken lane which runs northwards at right-angles to the D903 highway. 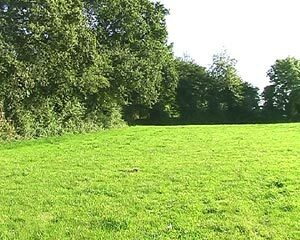 On 13th June 1944 the lane and surrounding fields became the scene of much bitter fighting when elements of the 506th PIR, heading west, encountered tanks and infantry from the German 17th SS Panzer-Grenadier Division moving in the opposite direction. 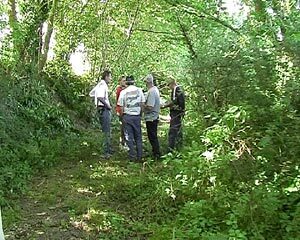 To this day 506th survivors of the encounter call this sunken lane 'Bloody Gulch'. Above left: The 'Gulch' is a very ancient trackway used by local farmers to move livestock. Tall hedgerows grow on either side and it still looks much as it did in June 1944. Above right: The 'Gulch' lies hidden within the hedgerow on the left. Picture taken looking south. So that troops landing on the beaches of Omaha and Utah could link up quickly it was imperative that the town of Carentan was captured as soon after D-Day as possible. 101st paratroopers entered Carentan on 12th June, following two days of vicious fighting to gain control of the causeway north of the settlement. Once captured the town was successfully held by the 101st despite numerous German counter attacks. 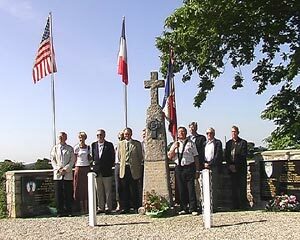 Above left: On 20th June an awards ceremony took place in the square in front of the town's WWI memorial. Above centre: The same area as it looked during April 2003. A mile or so north of Ste. Marie-du-Mont is a large farmhouse called Brecourt Manor. During the Spring of 1944, in hedgerows nearby, the Germans dug four pits into which they each placed a 105mm gun. This gun battery was perfectly placed to fire shells onto Utah beach. On the morning of 6th June 1944, 'E' Company, 506th PIR, led by Lt. Winters, successfully spiked all four guns and put the battery permanently out of action. Above left: Brecourt Manor today. Above right: Joe Beyrle II standing on the site of the number one gun position. On D-Day paratroopers from 3rd Battalion, 506th PIR were given the task of capturing two wooden bridges that crossed the Douve river near the village of Brevands. Despite being way below strength, due to the scattered drop, men from the 3rd Battalion successfully reached and seized the northern bridge exits. However, because Col. Sink (506th Commander) was unable to establish radio contact with his men at the bridges he ordered that the crossings should be bombed by three P-51 aircraft. Both bridges were destroyed at noon on 7th June. 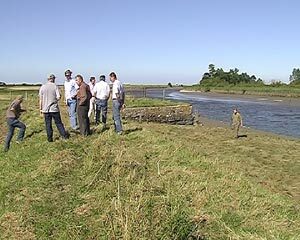 Above left and right: The road bridge site as it looked during August 2005.